A novel molecularly imprinted quartz crystal microbalance (QCM) sensor was successfully prepared for selective determination of sialic acid (SA) in human urine samples. To obtain the QCM sensor, we first modified the gold surface of the QCM chip by self-assembling of allylmercaptane to introduce polymerizable double bonds on the chip surface. Then, SA molecularly imprinted polymer (MIP) nanofilm was attached to the modified QCM chip surface. For comparison, we have also characterized the nonmodified and improved surfaces of the QCM sensor by using atomic force microscopy (AFM) and Fourier transform infrared (FTIR) spectroscopy. We then tested the selectivity and detection limit of the imprinted QCM sensor via a series of adsorption experiments. The results show a linear response in the range of 0.025–0.50 μmol L−1 for sialic acid. Moreover, the limit of detection (LOD) of the prepared imprinted QCM sensor was found to be 1.0 nmol L−1 for sialic acid, and high recovery values range from 87.6 to 108.5% with RSD < 8.7 (n = 5) for the spiked urine sample obtained. 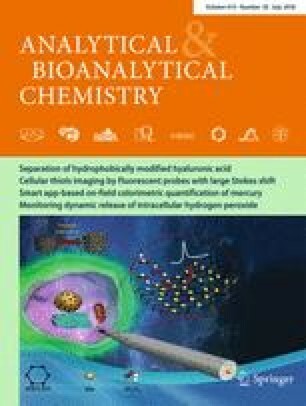 Overall, this work presents how a novel QCM sensor was developed and used to detect sialic acid in human urine samples. The online version of this article ( https://doi.org/10.1007/s00216-018-1094-7) contains supplementary material, which is available to authorized users. This work was financially supported by grants from the Natural Science Foundation of Guangdong Province (Nos. 2014A030307024, 2015A030313750) and the Innovation Projects of the Department of Education of Guangdong Province (2014KTSCX169). The authors declare that all individual participants from whom the serum samples were obtained gave informed consent, and the studies have been approved by the Shaoguan University Ethics Committee and have been performed in accordance with ethical standards.